Create a cohesive and elegant look on your hearth using the Panacea Five Piece Brushed Bronze Scroll Fireplace Tool Set. Eye catching scrollwork, steel construction, and a fantastic, brushed bronze colored finish lend a stylish hint to your fireplace, while providing all you need to keep it tidy. Large scrolls create a stable base for the item, allowing it to rest on a level surface, and a central, square metal shaft leads to the decorative topper. Place the included broom, poker, shovel, and tongs on the top scrolls, so your tools remain within easy reach of the fire. The tongs enable you to add logs to your fire safely, and the poker aids in repositioning them. Once the fire has been extinguished, use the brush and shovel to remove ash and keep the area clean. The brushed bronze hue throughout each piece brings an aged look to the item, and the all steel body will remain sturdy for many seasons of use. 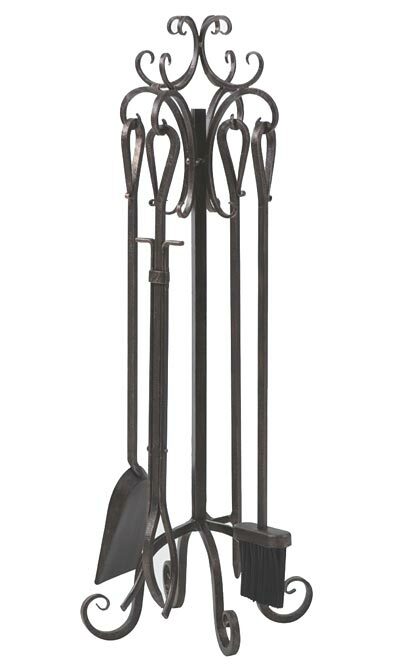 Bring an elegant look to your hearth using this Five Piece Brushed Bronze Scroll Fireplace Tool Set.